Submitted by igamaximus on Tue, 2018-12-04 15:16. Could you please add gamma ckeckbox and field inside of this great tool? I need to choose, sometimes to use converted straight RGB color, and sometimes i have to use gamma corrected RGB color, mostly with 0.4545. Thank you very much for this great tool. Submitted by Letniq on Thu, 2009-09-17 00:21. I know the alghorithm that I need to make It But I don't see the point why to have a massive array and formulas to calculate when I can use only one array of precalculated values. In that way I think I'm getting much better performance. Submitted by Anubis on Wed, 2009-09-16 15:04. Let me guess, now you seek how to add support for VR lights to the code, right? Submitted by wobi on Wed, 2009-09-16 07:11. Nice script man. But what about actually rendering the appropriate color instead of pulling the value from a pre-defined array? Just a thought. Submitted by Letniq on Wed, 2009-09-16 00:35. I call the "color" property because the vray lights use it instead of rgb. Submitted by Anubis on Tue, 2009-09-15 15:50. Also I always avoid "try/catch" for better performance. So the 2nd hint is about applying color to lights. Here needed some filter check to exclude non lights objects form selection. Also I see you call "rgb" and "color" properties at the same time. All Max built lights has both properties and they are equal, but for photometric is not. Here needed only rgb. But if the user has third party plugins, for example Brazil renderer, well, is not bad to exclude them too by checking for "rgb" property. So, what's next? Someone, to say me (for example), wish to use the script with Brazil lights, I'll just extend it myself for my needs. Ok, I hope you like my ideas. Submitted by Letniq on Mon, 2009-09-14 21:38. It will be great to give me some ideas for optimizing the code. I spent two days searching the net for the best way of color matching the wavelenth to rgb. There were some formulas to calculate it but the result was bad. Finally It turns out that to get the correct rgb color for some light temperature I must use some array of values from CIE so I decided instead of having formulas and array to have just array. Submitted by Anubis on Mon, 2009-09-14 20:04. I am glad to see fellow citizen here! Good job for the first script. 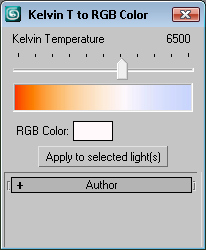 I did a quick search in Google and I found many results with hard coded Kelvin to RGB references, but maybe it will not be easy to find a conversion formula. It's very strange, right? I would say that you will come in a lot of trouble with this script :) In the meantime I found so you convert Kelvin (CIE 1931 2 degree CMFs) to sRGB. As a result of that there is a lot different RGB standards, would be nice if there was a formula, instead of they are all hard coded. Because you're interested, maybe you'll find something about. If you're interested I'll post it here.